I often grab up odds and ends, even broken jewelry that is cheap with good stones or interesting beads because I do a bit of beading and some jewelry repair. Many a friend has asked me to replace a missing stone in a treasured family heirloom or to go through the contents of her mother’s or grandmother’s treasure boxes to help decide what to keep, what to have appraised, what to sell, and what to discard. Some have brought me baggies of old jewelry because “no one wants these but I thought of you.” Such a haphazard collection is better described as an accumulation because few of my pieces have been cataloged or documented. If I had more money, it is possible I’d collect the real thing but perhaps not. 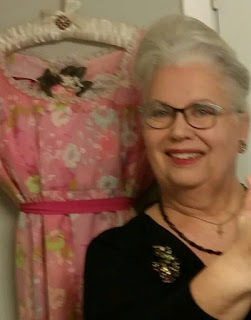 One of the things I love about this old jewelry is that it was the pride and joy of ordinary women who pinned it on their best dresses or coat lapels and wore it to town, to work, to parties, to weddings, to social and civic events, and to church. These sparkly items made those middle class or poor women feel pretty, rich, and valued. They contributed to their identities. These brooches and pins are the ones displayed in old photographs. Those pieces that are passed down through families become a connection to history that is both personal and cultural. Such women’s history is not always recorded elsewhere. There is something in me that says these things that have been so treasured are not (or should not be) rubbish. Many of the pieces reflect the aesthetics of their time and may be considered works of art. I have several pieces that I never wear but display on my dresser top or enjoy as beautiful art that I can hold in the palm of my hand. She was right. I gently cleaned the brooch with a soft brush and some canned air. I decided not to risk unsetting the stones with a more vigorous or liquid based cleaning. I judged there to have been at least two previous attempts at repair. When one of those ordinary women has tried to repair a family piece, I see it as an indicator of the value attached to the piece by its owner. My advice is that unless you can pay a professional to do a repair, unless they or you have access to matching stones, don’t do anything. Consider the missing stone part of the history and charm of the piece, pin it on your shoulder or lapel and wear it with pride and joy as our foremothers did. I wish I had taken a “before” picture. An original “ruby” had been reset but poorly and there is visible glue residue that obscures the sparkle. A second “ruby” had also been replaced with a slightly smaller but well matched red glass stone and again I note glue residue. One of the “emeralds” had also been reset or replaced; that stone is a lighter color and perhaps just a bit smaller so it could be a near miss replacement. Since glue residue is again visible, it could be that the glue has damaged the foil backing of the green glass stone which would dull the color. Fearing I might damage those stones I left most of the glue residue in place. I left all those stones in place since I thought they enhanced rather than detracted from the brooch and were a part of its history that I wished to honor. There is one large pearl and its setting entirely missing which leaves a small gap in the lower left center of the brooch. A poorly executed replacement had been attempted for the missing smaller pearl. I removed a simulated pearl glass bead that was too large for the setting with the hole in that bead distractingly visible. I may one day attempt a repair if/when I find a well-matched replacement pearl. There were several odd beads stuck onto the ends of some of the prongs along the bottom of the pin. 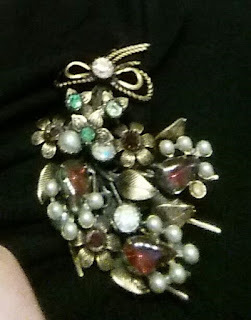 Wrong materials, wrong color, wrong style, and clearly not elements that were original to the brooch. I removed and discarded them. I suppose there might have been something on those prongs but I cannot imagine what, and this large brooch with multiple stones and settings is certainly enough. At that point I had a small, sculptural piece to lay on an antique handkerchief on the dresser in my flowers and lace over-the-top-Victorian bathroom in my previous house. I loved it there and had no intention to wear it. If memory serves, the original was a 19th Century brooch with emeralds, rubies, pearls, diamonds, amethysts, and smaller pearls in an 18-carat gold setting. The description named the original owner saying it had been custom made for her to proclaim her support for both Women’s Suffrage and Christian Temperance. My memory of the description of this original museum quality piece is that it dated to about 1850. The presence of three large diamonds could be indicative of a date after 1867 when South African diamonds were discovered and diamonds became more available. A few other dates may be helpful in considering the dating of my brooch and the original upon which it is based. The British Association for the Promotion of Temperance was established in 1835 and in 1884 the National Temperance Federation was founded. The Earl of Carlyle introduced a bill for female suffrage in 1851, and Jacob Bright introduced a bill for woman suffrage in the House of Commons in 1870. In 1897 local British societies that were advocating women’s suffrage merged into the National Union of Women’s Suffrage Societies. In 1903 the more militant Suffragettes emerged. The “language of flowers” expressed in fine jewelry was at its most popular in Victorian Britain between 1837 (or a bit earlier) and about 1850 and remained popular with the rising middle class and in America to 1880 or so. Late Victorian author Evelyn Whitaker (I archive books and ephemeral materials pertaining to her life and work) made extensive use of the language of flowers in her books, particularly in her novel Laddie. In 1876 Laddie was the prize story for the Christmas number of The Monthly Packet of Evening Readings for Members of the English Church. Its first book edition, published anonymously, was in 1879 by Walter Smith, London. 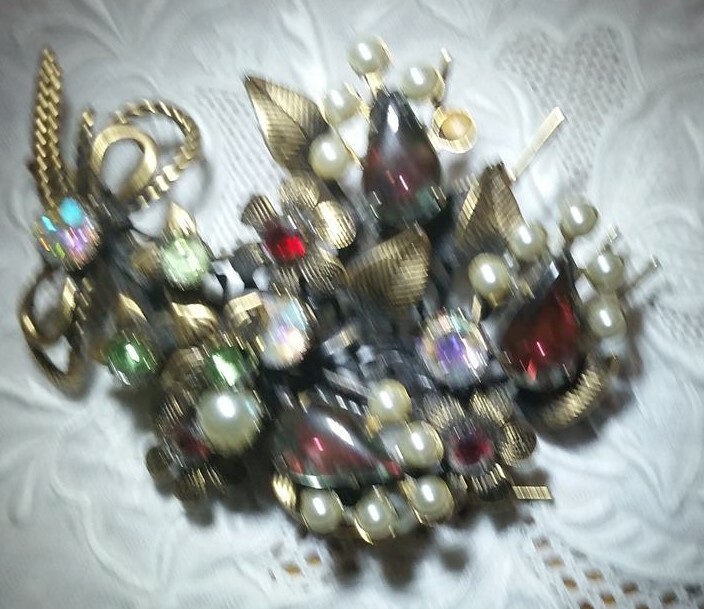 At first glance, my brooch appears to be a late 19th or early 20th Century (circa 1897) reproduction of the circa 1851 museum quality piece that once belonged to a wealthy woman who supported both Women’s Suffrage and Christian Temperance. The brooch has a stamped brass filigree base with multiple adjustable settings connected to a second brass setting atop it that contains multiple settings for various floral elements and settings for stones and beads. 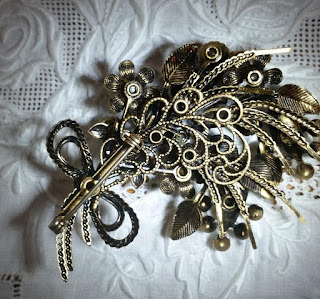 The brooch is very 3 dimensional and mimics a floral gathering. The workmanship is excellent. The aesthetic is pure 19th Century but the locking C-clasp which appears to be original is a strong argument that my brooch may be a WWII era American Victorian Revival reproduction. The gem stones with the possible exception of the pearls are all imitation. In any case, the meanings behind the stones and setting make this brooch a strong feminist statement and I wear it with pride and joy on appropriate occasions. A double infinity bow at the top indicates two things “tied together forever” a symbol of unity. The ivy leaves scattered throughout the brooch’s setting symbolize fidelity, eternal faithfulness, and friendship. The presence of a diamond, symbol of purity and eternity, is intended to bring the wearer strength. 3 Emeralds Emeralds are the gemstone for Venus signifying womanhood as a giver of life. In Christian symbology it is the color of the evergreen, eternally green and growing Eternal life. Emeralds are believed to enable clear thinking about past, present, future. Suffragette green represented hope and spring, the season of new life. The emeralds are in a 3-petal floral setting which I don’t recognize. The three petals could reinforce the idea of past, present, future. If it is a stylized pansy, it would signify remembrance. 3 Rubies "Who can find a worthy woman, a woman of valor. Her value is greater than rubies.” The image from Proverbs 31 is a salute to wisdom, particularly feminine wisdom. A ruby may also represent courage. Each ruby is set in six-petal rosette, associated with Aphrodite and represents sexual energy, and femininity. Six is a perfect number. It is sometimes called the “Seed of Life” and represents Creation. Beside one of the ruby rosettes is a diamond to signify purity and strength. Beside the second ruby rosette is a large pearl, “the pearl of great price” from the parables of Jesus. Pearls are sometimes viewed as symbols of purity and feminine wisdom. The third ruby is flanked by a diamond and a large pearl which is missing in my brooch. 3 Amethysts The purple amethyst is the symbol of royalty and political power. The ancients thought it was formed from Dionysus’ drunken tears, a meaning that may be reinforced by the tear drop shape. Victorians often used seed pearls to symbolize tears but these seem a bit too big. For the suffragette, purple is not only the color of royalty but of freedom and dignity. Amethysts also symbolize chastity, sobriety, and self-control. 5 pearls around each amethyst Victorians often used seed pearls to symbolize tears but these seem a bit too big. I think they are again“the pearl of great price” representing the thing of such value that it is worth pursuing at all costs. For the suffragette, white is the color of purity in both private and public lives and pearls are often used in suffragette jewelry. For the temperance advocate, the goal would be sobriety. Five is a significant number in biblical numerology and indicates the grace of God. "The goals of both Women's Suffrage and Christian Temperance are worth pursuing at all costs and are achievable by the grace of God." Emeralds, Pearls, and Amethysts may represent the green (Give), white (Women), and violet (Votes) of the suffragette banners. On Friday 20 January 2017, Inauguration Day I dressed in all black as a sign of mourning and I wore this brooch. I wore it again on Saturday. I couldn’t march but I did go to the Museum of Fine Arts Houston which one of my friends had suggested as an alternative activity to affirm support for the National Endowment for the Arts. Birthstone amethyst earrings that belonged to my paternal grandmother, Oma Calahan Cummings. The gold cross belonged to my mother, Dorthy Wieland Cummings, who bought it at a “junk shop” and wore it throughout her teen years as a profession of faith. I beaded my necklace of natural garnets (my birth stone) and antique Czechoslovakian ruby glass beads. My mother loved it at first sight and also had a January birthday so I loaned it to her for a decade or so. The pink stone and pearl pin ornamenting the hanger is one of my first pieces of jewelry. I've had the Victorian reproduction piece since about the seventh grade. The dress is the one I wore for my sister’s wedding as her matron of honor. Do you know something about my brooch that I don’t? Have you perhaps seen the original in a museum? Do you have a special piece of jewelry? Name your favorite feminist/suffragette. Mine is whoever wore the original of my brooch.